HomeImprove the CXCustomer Experience: its just another term for Customer Service… isnt it? Customer Experience, CX, CE…whatever you want to call it, it seems to be the #1 buzz word in business at the moment. Even looking at seek.com.au, there is an incredibly broad range of roles around that use CX in their title. Add to this the ever-growing number of consultants who profess to specialise in the area and we almost have an epidemic on our hands!! 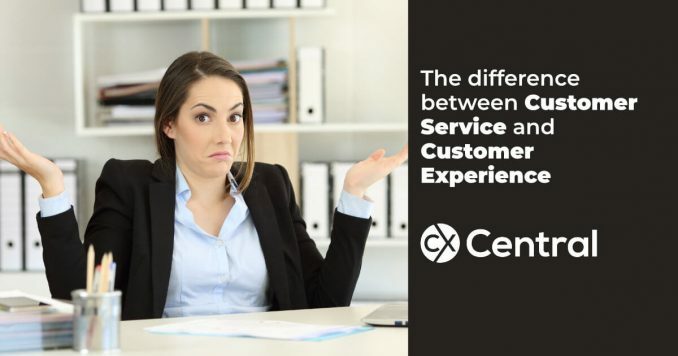 I thought it would be beneficial for those new to the industry to explain how I define the difference between customer service and customer experience. Over the years, my definition has been strongly influenced by a variety of researchers and practitioners in the field. I lean particularly though on the writings and thought leadership of Fred Reichheld, Harley Manning, Kerry Bodine and Jeanne Bliss and would recommend all these as readings and blog/newsletter subscriptions. To my mind, customer service is just one part of customer experience…the front end bit…it’s the direct, one-on-one interaction that we have with our customers. Humans, being what they are though, mean there are other factors that come into play in how they rate your brand or business. The following equation provides a good illustration of my point. You will see from this equation that customer service is only one part of the equation  the actual interaction. You could also go as far as saying that the interaction a customer might have is only part of the part. The customers interaction is not just influenced by the skills of the call centre agent or the ease of using the website. The functionality of the relevant product/service and how easy/convenient the transaction is, are also essential considerations. The sum of all of this is that the customer experience must be viewed across the entire customer journey. It is this complete picture that will influence loyalty, future buying behaviour, retention and cost to serve, amongst many other factors that impact the success or otherwise of all types of businesses. This way of thinking has obvious implications for siloed or departmentalised businesses. In my opinion, a customer service department or contact centre cannot fairly use Net Promoter Score or Customer Effort as measures of their performance alone. As the above equation suggests, when providing feedback in relation to either of these scores, customers are likely to reflect on more than just the experience they may have when dealing with agents, whether virtual or live. If the ownership of scores can be shared across silos, however, their power is realised through a shared engagement in the customer journey and an understanding of the impact of a variety of activity and decision making on the customer. As you can see, CX is quite a concept to get your head around, let alone be able to generate an effective CX strategy for your business. But, done correctly, it’s worth its weight in gold.